With a reported catch of 615 salmon the excellent fishing on the River Moy system continued for yet another week. Fresh fish were caught on all fisheries with overall angling effort increasing. On the Ridge Pool, Northern Ireland flyanglers, Robert Logue & John Shaw, each had five fish and released three grilse each. Also on the Ridge Pool, John Ryan, Tipperary, caught a 5.25 grilse on fly. A Russian group of four, led by Alex Neserove, landed 9 salmon over two days on worm & spinner on the Mount Falcon Fishery, while David Thomas, Scotland, had seven salmon (4 released) on prawn fishing the Coolcronan water. Joe McGee from Northern Ireland was successful on the Foxford Fishery with two grilse of 4 lbs. and 5 lbs. on worm and anglers on the Foxford Salmon Anglers' waters caught in excess of 90 fish during the week. The Cloongee Fishery also provided superb fishing with the Mark Parsley group form the UK catching 41 salmon over 8 ½ days on worm, spinner and bubble & fly. Thierry Coulm also reported a very good week for a group of French anglers with a total of 23 salmon mainly caught on bubble & fly. Anglers on the East Mayo stretch also enjoyed excellent salmon fishing with a reported catch of 120 fish. Amongst the successful anglers were Paul Kelly, Sligo, with two fish at 3 lbs. and 9 lbs. on fly and Reg Bishop, UK, with an 11.5 lbs. salmon on worm. Also on East Mayo, Bertrand Savary, France, landed two grilse at 4 lbs. and 6 lbs. on fly, while Swiss visitor, Felice Ceruso, had two grilse on worm averaging 4.5 lbs. Monday June 27th - Jim Keenan had two nice fish on the fly weighing 7 lbs. and 5 lbs. at the Falls. James Kennedy also had a 7 lbs. fish at the Falls on the worm. A visiting group of French anglers enjoyed a good day landing 10 fish between 4 anglers (3 released). The best fish of the group was caught by Loat Paul on the prawn weighing 12 lbs., while the rest of the grilse were in the 3 - 5 lbs. bracket. Juvenile angler, M.J. Graham, caught 2 nice grilse on the worm. Tuesday June 28th - Noel Fairbanks, Warrick Bowden and Bernard McKeon had a good day on the fly at the Falls landing a total of 6 grilse averaging 4.5 lbs. Leslie Cooper landed a lovely fresh 10 lbs. fish on the worm at the Falls, Donagh McDonnell also had a nice fish on the worm at the Falls weighing 8 lbs., John Connolly released two fish weighing 4 lbs. and 5 lbs upriver. Sean Maye also released a 4 lbs. fish on the fly upriver. Wednesday June 29th - The group of French anglers continued to be successful landing 8 more, all on prawn and worm. Albert Berry and Pat Foley caught 4 grilse fish between 5 lbs. and 6.5 lbs. on the fly at the Falls. Thursday June 30th - Thursday was a good day with over 30 fish caught, with a decent number of these released. All fish were caught on the fly and worm and were in the 3 - 6 lbs. bracket. Friday July 1st - Bernard Mannion had a fine ten-pounder on the worm at the Falls, while visiting anglers, Ciaran McCuddy and Padraig McMahon caught 4 grilse on the worm averaging 4.5 lbs. The French party had another good day on Friday landing 10 fish in total with two good ones of 7 lbs. (worm) and 10 lbs. (prawn). John Connolly released two small grilse under 3 lbs. upriver on the fly. Roy Cooper, Patrick O'Connor and Stephen Moore all had fish upriver on the worm of about 4 lbs. Saturday July 2nd - Saturday was again a consistent day with 20 fish caught. The two best fish of the day were landed by Damien Quigley (6 lbs. on fly) and visiting angler Robin from Tottenham (6 lbs. on worm). Sunday July 3rd - Sunday was also a very productive day with a good number of fish being caught. Amongst the successful anglers were: Hugh and Noel McKeever, Joan Bowen-Walsh, Johnny Shields, Gerry McHugh and Albert & Alan Shaw who all had grilse between 3 lbs. and 7 lbs. John Murray caught two sea-liced grilse on a ½ " Willie Gunn tube, while David O'Connor also had fish on the same fly. Noel Barber caught & released two grilse on the fly upriver. 24th June - Werner Meckle from Germany had 3 fish on fly, as did Aidan Brophy, Dublin, while and Eamon Power and Brian Hennessey from Waterford also had their quota but released 4 fish between them. 25th June - Aidan Twoomey, Waterford, showed his father Thomas how it is done with a 2-0 score line. Andrew Davin from Northern Ireland had 2 fish for 4 & 5 lbs. Brian King caught a nice fish of 7.5 lbs. on the fly and added another of 3 lbs. His mates, Gerry Hartigan and Damien Nolan, from Limerick had a brace each, ranging from 4 to 5 lbs. All above fish came to the fly bar Gerry's which took a shrimp. 26th June - Dr. Frank O'Hara had 4 fish on fly and released one, all averaging around 4.5 lbs., Fintan Murphy, Oranmore, landed 3 fish about the same average weight (two on fly one on shrimp. Greg Forde took time off his busy schedule to grass a lovely six-pounder on fly. 27th June - Ned Cusack again landed a nice grilse on the shrimp of 4 lbs., while Spanish anglers Jose and Jesus Maquiteria had 4 fish to the fly from 4 lbs. to 6 lbs. Peter Butler, the infamous writer on coarse angling, caught 2 fish on the fly which was a great achievement after he had major surgery on his hands last year. Local angler, Neil Spellacy, had a great day with 5 fish all between 4 and 5 lbs. on fly, releasing 3 to a killer fly he tied the night before, which he went home without! 28th June - Annie and Peter Taylor, UK, had a fish apiece on fly and shrimp. Sean O'Toole caught a brace in quick time on the fly of 4 lbs. each, while Henry Cosgrove ,Tuam, and Stephen Cullinane, Galway), had a brace as well. 29th June - Dave O'Reilly caught 2 fish of 5 lbs. on fly, while a visiting angler from Belgium, who never took a fly rod up before his day on the Weir landed a 4 lbs. fresh run fish. Angling activity on Lough Corrib the week gone by was somewhat quieter with less anglers about and changeable weather conditions and sparse hatches thus culminating in a quiet spell. The little fishing that was had was on caenis and sedges. Larry McCarthy from Corrib View Lodge, Glencorrib www.corribangling.com reports a slow-down in caenis hatches but some sport was still available early mornings over the last week. Tony Ling, Mark Thomas and Tim Gawthorn from England all enjoyed early morning success catching 18 trout over 3 days with all fish returned. Larry himself took advantage of two free mornings and caught 11 fish up to three pounds on Saturday and Sunday. 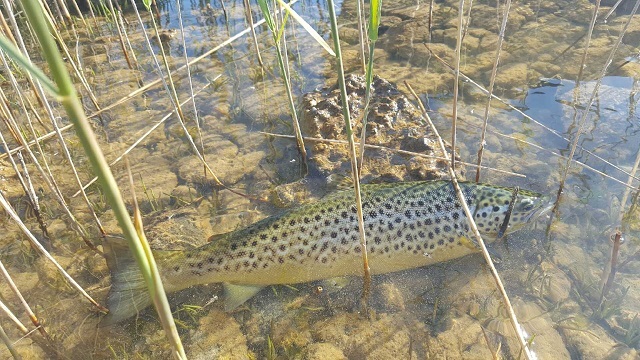 Hopefully with some settled weather Larry is hoping to see action to sedges or possibly the start of Corrib's smaller second hatch of mayfly. Kevin Molloy of Baurisheen Bay Boat Hire (+353 (0)87-9604170) reported that a group of visiting German anglers enjoying a great day on Lough Corrib on Tuesday last landing three trout on wets and on the troll with the best fish being 3.25 lbs. Kevin himself was fishing on Friday last and had one trout of 2.25 lbs. on a wet sedge pattern.